Hey there, friends! Recently, I created a tier on Patreon allowing people to ask me to review movies, books, or another piece of media I should be able to obtain. There are two slots available, and long-time Patron ‘Becca gladly jumped on one of them. 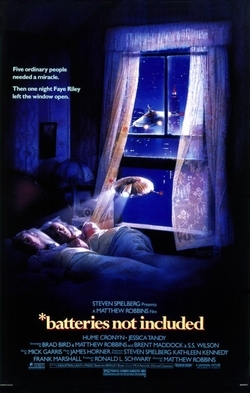 For January, she chose a movie from 1987 that I remember catching in the theaters, *batteries not included! So ‘Becca, thank you for your support, and here’s your post about the film! First off, for those who don’t know anything about this thirty-plus year old film (dang, I’m old…), it is a simple story about tenants who live in a neighborhood that’s being razed for new high rises. Their building is the only one left standing, and there is a lot of pressure to get them out of their building. As they are looking for help, a couple of small spaceship aliens appear, and seem to be their saviors. It’s a film that’s kinda sweet, with a bit of comedy, and some really decent practical effects. It was produced by Steven Spielberg, and directed by Matthew Robbins, with a writing team that includes Brad Bird! Now, like I said, I’ve seen this movie numerous times as I grew up. I was 10 when it was released, and I remember seeing it in the theater. Then we either had the VHS growing up, or we rented it quite often. For a while, it was streaming on Netflix, where I gave Lizz her first exposure to the film, and most recently, I rented it on Amazon. I tell you, the effects hold up pretty well, though there are some parts where they aren’t totally seamless (remember, it’s over thirty years old!). The story is decent, touching on the tearing out of the old and replacing it with the shiny and new that really seems to be a consistent story, as also shown by Up about twenty two years later. The cast of characters is solid, as well. Hume Cronyn and Jessica Tandy are two people I remember seeing in movies a lot as I was growing up. Jessica Tandy, in particular, played the role of an older woman who, by appearances, was suffering from Alzheimer’s, and while that helped provide some laughs and drama when I was younger, it was really rough to watch now, as someone who has lost a family member when they were in the late stages of the disease. Everyone else is fine, as well, but this really seems to be a vehicle for those two, and the spaceship/aliens. Yes, the spaceship/aliens. If you have no idea what I’m talking about, look at the movie poster attached to the image. They are small ships, about the side of a dinner plate, that like to fix things. When the building is trashed, the ships fix it. They also end up having baby ships, using electricity and scrap metal. Growing up, I loved the ship designs, and still think about looking for models of them online (I have too much to do, and too little money, so don’t send me links! ), and as I was looking through IMDB, I realized part of why I liked them. The designs were done by Ralph McQuarrie, and the models were built by Greg Jein! As a long-time Star Wars and Star Trek fan, this kinda makes sense to me, now! They are just fantastic designs. All in all, I still really enjoy *batteries not included, even so many years later. My thanks to ‘Becca for asking me to watch this as part of her Patreon rewards, and I’m looking forward to seeing what she recommends that I watch in March! 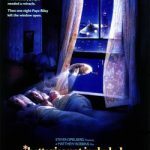 If you’re interested in *batteries not included, then head over to Amazon (Affiliate Link) where you can rent it, or pick it up on physical media. If you’re interested in helping on Patreon, and perhaps even recommend a piece of media, take a look at my page (Link) to see what the different levels offer! Thank you all, and I’ll see you tomorrow, for Tuesday Tidbits!